Everyone deserves the chance to earn a college degree, regardless of family income. Unfortunately, that’s not the case right now. The cost of a college education is simply out of reach for far too many families. That’s why Gil Cisneros has worked to level the playing field, helping to provide scholarships to young people. 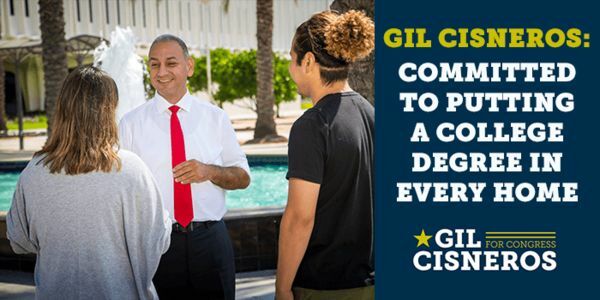 Now Gil Cisneros is running for Congress to continue working to bring accessible and affordable college to everyone. But he needs your support to make this happen. Sign on to show that access to a college education is a key priority, then add your own personal comment about why this is important to you.